A.J. Hacket is credited with creating New Zealand’s adventure tourism industry. In the 1980s a group of Oxford University students formed the Dangerous Sports Club with one of their most popular pastimes being jumping off bridges with a rope tied to their ankles. Kiwi lad, Alan John Hackett, a born risk taker, liked the idea and tried it himself by jumping into water from a 20metre high cliff near his Auckland home. 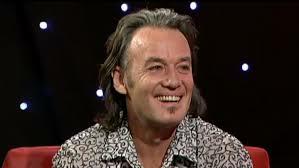 He liked the adrenaline rush so in 1986 he asked a friend to film him jumping off Auckland’s Greenhithe Bridge. This was followed by a 30metre jump off a bridge in Hamilton then wanting an even higher fall and some publicity, he made a 40metre jump off the Auckland Harbour Bridge. The resulting publicity finally drew his offbeat activity to the public’s attention. After the success of the harbour bridge jump, A.J. as he is known, wanted to see how his bungy jump would be received overseas so in June 1987, without permission, he jumped off the Eiffel Tower in Paris. The publicity this received marked the dawn of the A.J. Hackett Bungy Jumping business. ‘Bungy’(also spelt bungee) is a Kiwi word for an elastic strap made from latex rubber. In 1988, A.J. and his business partner and fellow adrenaline junkie, Henry van Asch, opened their first bungy jump enterprise in the North Island ski town of Ohakune but it wasn’t until they shifted to Queenstown’s Kawarau Bridge shortly afterwards that bungy jumping entered the public’s radar as a tourist activity. On the first day of their Queenstown operation in November that year, 28 people paid $75.00, a large amount at that time for a short burst of excitement, to plummet from the bridge to the surface of the fast flowing river 43 metres below. Today, this specific jump costs $150 and is regarded as the mother of bungy jumps worldwide and is taken by 7% of all tourists to Queenstown (around 30,000 jumpers annually). In fact, Queenstown is still regarded as the home of the bungy jump with 3 of the world’s most spectacular jumps on offer around the Kiwi alpine resort. Over the next decade the adventurous pair expanded their business to 15 sites around New Zealand and the world including such tourist hot spots as Macau, Las Vegas, Acapulco, Switzerland, South Africa and Bali. There is also a bungy jump over the Victoria Falls in Zimbabwe. Fifty other companies have tried to copy the Hackett system in various locations around the planet. Perhaps the most risky of these non-Hackett jumps is the Pucon jump in Peru which involves jumping from a helicopter towards the boiling lava of a live volcano. In 1998 A.J. 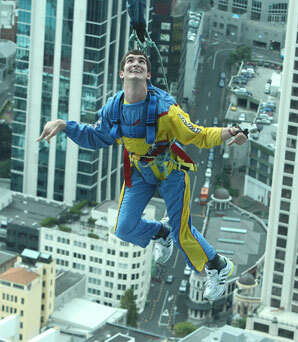 made a well publicized jump off Auckland’s Sky Tower. Today, it is one of just a few urban bungy jumps in the world and has attracted a list of celebrities including Louis and Niall from One Direction, and singers Michael Buble, Ellie Goulding and Beyonce. Even comedian Jimmy Carr has taken the urban plunge. In 2000, A.J. jumped off the Royal Gorge Bridge in Colorado, the highest suspension bridge in the world. That year, he also did the first bungy jump from a helicopter plummeting 380metres (1,250ft). In 2006, he successfully completed the highest bungy jump from a commercial building when he dropped 233 metres (764ft) off the Macau Tower in China to celebrate the building’s opening. In 2007, he doubled the height of his first helicopter jump when he accomplished 700metres (2,300ft) from a helicopter in Malaysia. The A.J. Hackett company now generates $14 million a year from the 70,000 jumpers who are attracted to the thrill of falling to earth on the end of an expanding cord. The oldest male to jump so far was 91 with the oldest woman only 6 years younger. Although A.J. Hacket now lives in Switzerland, last year he was appointed Officer of the New Zealand Order of Merit in the Queens’ Birthday Honours for services to adventure tourism.